MicroRNAs (miRNAs) are small non-coding RNA molecules, approximately 22 nucleotides in length, that regulate gene translation through silencing or degradation of target mRNAs. They are involved in multiple biological processes, including differentiation and proliferation, metabolism, hemostasis, apoptosis or inflammation, and in pathophysiology of many diseases. Numerous studies have suggested circulating miRNAs as promising diagnostic and prognostic biomarkers of many diseases. In humans, there are two distinct precursors of mature miR-1-3p, named miR-1-1 and miR-1-2. Genes for miR-1-1 and miR-1-2 precursors are located on chromosomes 20 a 18. Mature miR-1-3p has pivotal roles in development and physiology of muscle tissues including the heart. Changes in miR-1-3p expression lead to occurrence of many cardiac diseases. miR-1-3p is known to be involved in heart diseases such as hypertrophy, myocardial infarction, and arrhythmias. Studies have shown that miR-1-3p is an important regulator of heart adaption after ischemia or ischemic stress. 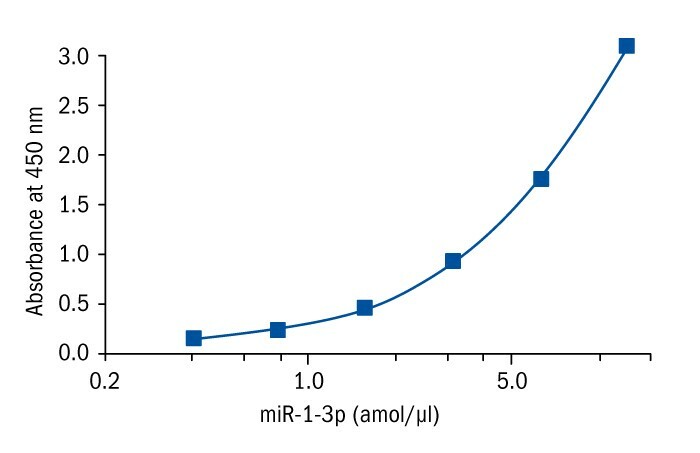 Under physiological conditions, miR-1-3p is present at very low levels in plasma. However, the level of miR-1-3p is significantly increased in myocardial infarction patients. In addition to the pathophysiological roles of miR-1-3p in cardiac diseases, many studies have also demonstrated that aberrant expression of miR-1 plays important roles in the initiation, development and metastasis of human cancers such as rhabdomyosarcoma, lung cancer, bladder cancer or prostate cancer. Tao, Ge, and James F. Martin. “Genetics: MicroRNAs get to the heart of development.” Elife 2 (2013): e01710. Zhao, Yong, Eva Samal, and Deepak Srivastava. “Serum response factor regulates a muscle-specific microRNA that targets Hand2 during cardiogenesis.” Nature 436.7048 (2005): 214-220. Li, Jianzhe, et al. “MicroRNA-1 in cardiac diseases and cancers.” The Korean Journal of Physiology & Pharmacology 18.5 (2014): 359-363. Li, Qing, et al. “Attenuation of microRNA-1 derepresses the cytoskeleton regulatory protein twinfilin-1 to provoke cardiac hypertrophy.” J Cell Sci 123.14 (2010): 2444-2452. Ikeda, Sadakatsu, et al. “MicroRNA-1 negatively regulates expression of the hypertrophy-associated calmodulin and Mef2a genes.” Molecular and cellular biology 29.8 (2009): 2193-2204. Boštjančič, Emanuela, et al. “MicroRNAs miR-1, miR-133a, miR-133b and miR-208 are dysregulated in human myocardial infarction.” Cardiology 115.3 (2010): 163-169. Girmatsion, Zenawit, et al. “Changes in microRNA-1 expression and I K1 up-regulation in human atrial fibrillation.” Heart Rhythm6.12 (2009): 1802-1809. D’alessandra, Yuri, et al. “Circulating microRNAs are new and sensitive biomarkers of myocardial infarction.” European heart journal 31.22 (2010): 2765-2773. Yan, Dongsheng, et al. “MicroRNA-1/206 targets c-Met and inhibits rhabdomyosarcoma development.” Journal of Biological Chemistry 284.43 (2009): 29596-29604. Nasser, Mohd W., et al. “Down-regulation of micro-RNA-1 (miR-1) in lung cancer suppression of tumorigenic property of lung cancer cells and their sensitization to doxorubicin-induced apoptosis by miR-1.” Journal of Biological Chemistry 283.48 (2008): 33394-33405. Chiyomaru, Takeshi, et al. “Functional role of LASP1 in cell viability and its regulation by microRNAs in bladder cancer.” Urologic Oncology: Seminars and Original Investigations. Vol. 30. No. 4. Elsevier, 2012. Kojima, Satoko, et al. “Tumour suppressors miR-1 and miR-133a target the oncogenic function of purine nucleoside phosphorylase (PNP) in prostate cancer.” British journal of cancer 106.2 (2012): 405-413.